Clinical psychologist Dr. Rachel Busman shares some information about helping young nieces and nephews transition to fall routines. It’s amazing that we are already starting to think about kids going back to school! Summer comes and goes so quickly. 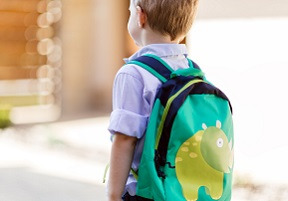 As a clinical psychologist and expert in anxiety disorders, I’m well versed in some of the concerns that arise as kids transition back to school, face new social situations, and confront some new (and maybe not so new) fears. Besides being a mother and a psychologist, I am an aunt as well. I have four nephews and one niece, and have had the privilege of watching them grow and develop. I think family members who share caregiving roles on a regular basis are in a great position to act as another set of eyes and ears during a potentially tough time. But to be most effective, it’s important for you to know what’s developmentally appropriate when kids are going through a transition and what might be cause for concern. Change can be stressful, and that certainly includes going back to school, switching from a summer to a fall routine, and adjusting to an earlier bedtime. That’s why it’s normal and expected for kids to “push back” and test some limits. “Why do I have to go to bed earlier?” or “Why do I have to go back to school?” are questions that may arise. The good news is that most kids are resilient and cope well when they have good adult models. Aunts can help kids understand that change and transition are a normal part of life and that adults can help kids feel comfortable about changes if they’re feeling worried. It’s also important for aunts to know what behaviors to look out for. A child who is a little sad or anxious for a day or two, or who presents with sporadic oppositional or defiant behavior is par for the course. Who hasn’t had a bad day?! However, changes in behavior or mood that are more persistent, and that interfere with a child’s ability to do her job as a kid (be part of a family, go to school, have fun), are cause for concern. Children might not verbalize how they are feeling, so paying attention to changes in sleep, appetite, interest in activities, and overall mood is key. What should you do if you have real concerns? The Child Mind Institute offers a Symptom Checker screening tool that can highlight possible mental health conditions and guide adults toward next steps for getting care. Our Guide for Getting Good Care is another valuable resource that can help all caregivers navigate the process of accessing mental health evaluation and treatment. Aunts are so important as fun, caring adults in children’s lives. Hopefully now you are in a better position to observe and note possible areas of concern to make sure your little niece or nephew is happy and healthy!